You know better than anyone; small business owners and nonprofits just can’t do it all. That’s why it’s important to have employees, volunteers, or friends and family to help get things done. But what happens when you and one of your staff members part ways? What do you do when that departing staff member has the keys to your business’ social media accounts? That situation is an unfortunate reality for many businesses. For some, it plays out publicly. For example, a local breakfast diner’s Facebook admin recently blocked access to the owner and began posting explicit and offensive content. This led to confused customers, rumors, and even boycotts. But there are steps you can take today to prevent that from happening to your business. How do you get help with your social media marketing while protecting your Facebook page and business’s reputation? Facebook’s page roles setting allows you to limit the amount of access your employees have. Everyone who works on your page can have a different role, depending on their job, while you maintain control over just how much freedom your employees have to act on behalf of your business. To find page roles, go to your Facebook Business page and find the Settings option. Next, click on the page roles option in the left menu. Here, you can see a list of people who have access to your page. 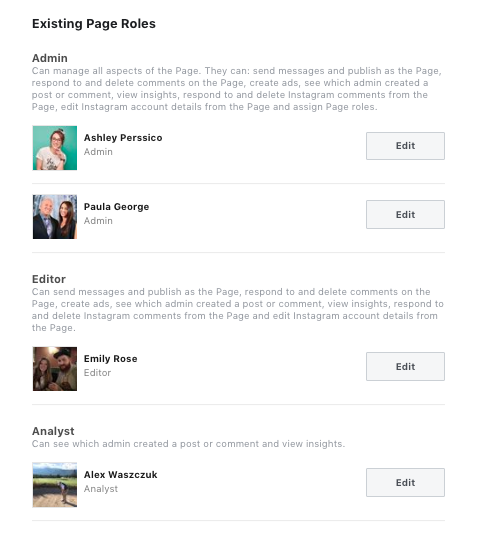 You can remove people from existing page roles or add someone new to your page. When adding someone new, Facebook allows you to search for their name or add them via email. You can also change the roles that each person has by clicking the edit button next to their name and then choosing the new appropriate role from the dropdown menu. There are six different types of roles for people who manage pages, and each one has varying levels of access. You can have as many users on your page as you’d like and can have multiple users assigned to the same kind of role. However, each person needs their own personal Facebook account to be added to a page. Admin – This is the highest level of access on a Facebook page. Admins can assign roles and change others’ roles. They can also post on the page, respond to messages, create Facebook ads, and view analytics (also known as Facebook Insights) for the page. You want to limit this level of access to the least number of people possible. Editor – An editor has all of the rights of an admin except for adding and assigning page roles. They can post to the page, respond to messages, create ads, and view Facebook Insights. Moderator – Page moderators have less access than admins and editors. They can’t post content to the page, but they can respond to comments posted on the page by your fans. They can also send messages, create ads, and see Facebook Insights. Advertiser – Users in the advertiser role are limited to only creating Facebook or Instagram ads for the page, viewing Facebook Insights and the page quality tab, and seeing who published as the page. Analyst – This role has the least access of all the options. An analyst is restricted to viewing Facebook Insights, the page quality tab, and seeing who published as the page only. They cannot create ads or post as the page. Jobs Manager – If you have a specific employee who manages hiring and other HR-related responsibilities, you would likely want to assign them as a jobs manager. This role has the same access as an advertiser, plus the ability to publish and manage jobs. As the business owner, your personal Facebook account should be set up as an admin for your page. If you choose to assign an additional admin role to someone on your staff, make sure that this person is someone you trust. Remember — page admins can reassign roles. This means that if you and the person you’ve assigned as an admin have a falling out, they can delete you as an admin and take over the page. Unless you have a co-owner, we recommend only assigning yourself the admin role. The best role for someone who is helping with your Facebook page is editor. These users can help with the day-to-day activities of your page and you, as the admin, can remove editors once they leave your company. If you have an employee or volunteer who only helps with customer service on your page — someone who answers customer questions or responds to comments — the moderator role may be best for them. The advertiser role should be assigned to anyone who works with ads for your business. Finally, if you have staff that helps with content strategy or planning, you might want to give them access as an insights analyst so they can get a picture of what kind of content works best for your page. 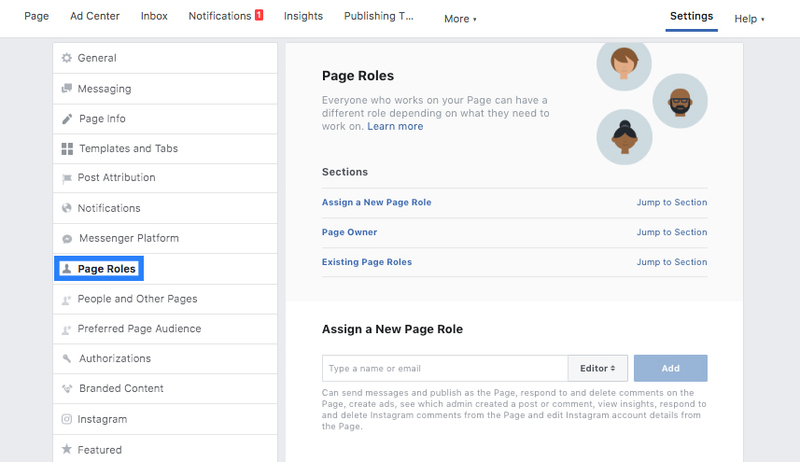 Tip: If your business runs a lot of ads or has many people working on your Facebook page (think 10 or more), then you might want to set up your page through Facebook Business Manager, which is more helpful for such complicated business setups. It’s great to have help when it comes to your social media marketing. But, like anything else, it’s smart to avoid having too many cooks in the kitchen. By keeping your page roles list clean and manageable, you will always know exactly who has access to what. This will allow you to easily remove departing employees and hold your staff accountable for content and customer service. Want to learn more? Check out our other social media blogs.